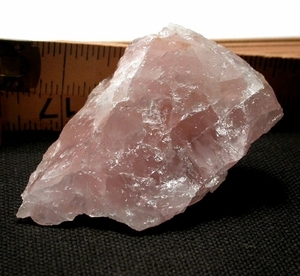 Just like pink jelly is how translucent this South Dakota rose quartz rough is. We suspect the lapidary in you would love working with it! 1">1-1/2"x 1-3/4"x 2-7/8", this small cabinet piece could, of course, be left whole with which to do your trusting dream work. A light amount of iron oxide, and several tiny full color rainbows are present.